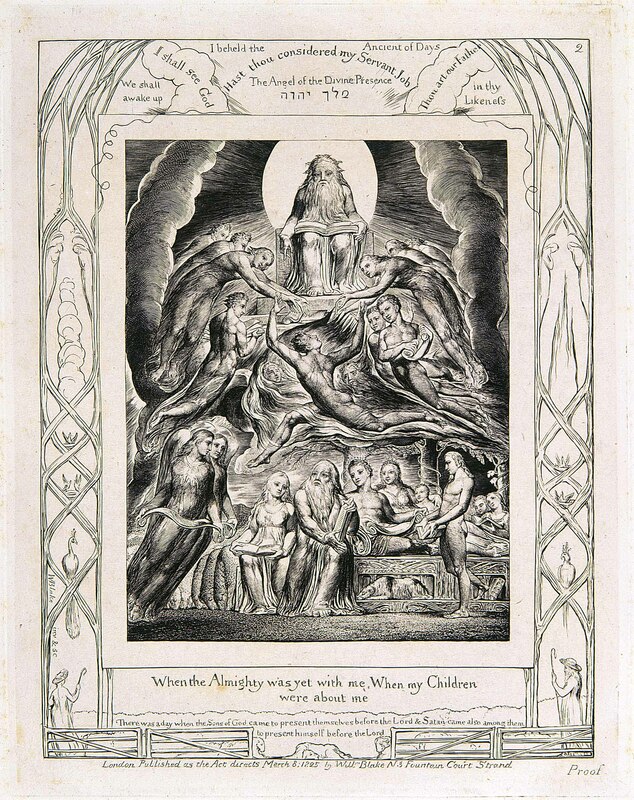 The William Blake Archive emphasizes accuracy and objectivity. The photographed or scanned images are made faithful to their original objects in scale, color, and detail. The editors’ notes are largely bibliographic and informative. The illustration descriptions consist of precise observations deliberately void of interpretation. The transcriptions are as diplomatic as the digital medium allows. And the explicit relationships between objects in the Archive are material; one can see, for example, copies of prints from the same relief-etched copper plate, or a design carried from a water color drawing to an engraved illustration. The scholar must be free to make his or her own interpretations. Since beginning to redesign the back end and front end of the site, the editors and staff have realized that more kinds of relationship might be made explicit. The challenge has been to decide which ones conform to our emphasis on accuracy and objectivity. In a neutral presentation of art and its contextual information, we can’t tell the scholar that object X relates to object Y because they embody the same theme. That would impose on him or her our own interpretation. But we can say that X relates to Y because they contain some of the same text. In this paper we discuss the difficult task of digitally presenting more kinds of relationships in the Archive while staying objective. 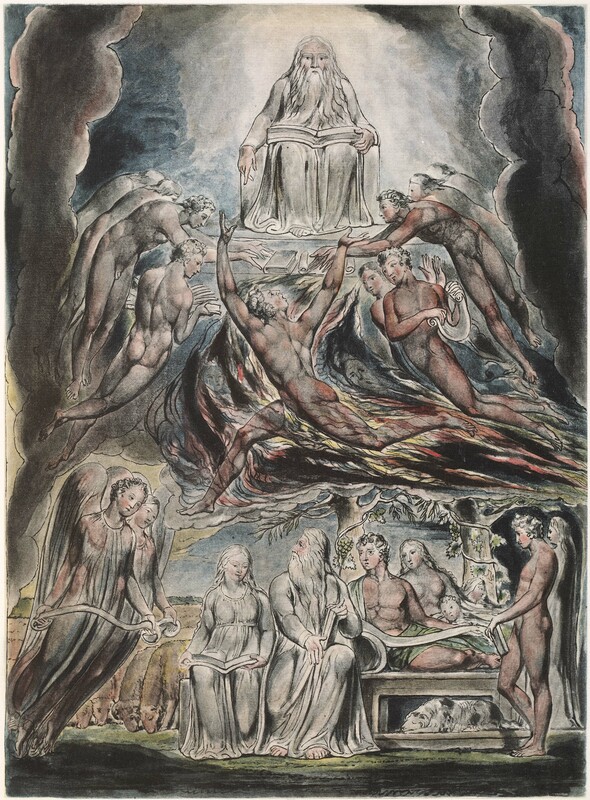 We explain how the task has compelled us to reevaluate Blake’s methods and reencode the connections amongst his works accordingly. We describe planned enhancements to our tools used for representing and displaying these connections--enhancements that would benefit all archives, not just the Blake Archive. And finally we gesture towards further research into the philosophical context of Blake's practice of making related art and into the idea of relationship in archives in general. Since beginning to redesign the back end and front end of the site, the editors and staff have realized that these relationships encoded in our data should be made more accessible and that even more kinds of relationship should be added. The challenge has been to decide which ones conform to our emphasis on accuracy and objectivity. In a neutral presentation of art and its contextual information, we cannot tell the scholar that object X relates to object Y because they embody the same theme. That would impose on him or her our own interpretation. But we can say that X relates to Y because they contain some of the same text. In this paper, we discuss the difficult task of digitally presenting more kinds of relationships in the Archive while remaining objective. 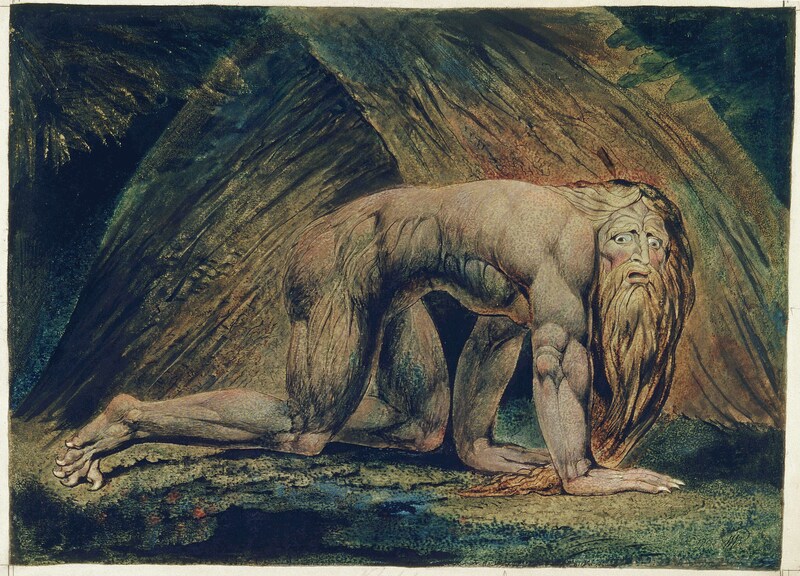 We explain how the task has compelled us to reevaluate Blake’s methods and re-encode the connections amongst his works accordingly. We describe planned enhancements to our tools used for representing and displaying these connections — enhancements that would benefit all archives, not just the Blake Archive. And finally, we gesture towards further research into the philosophical context of Blake's practice of making artworks related to each other and into the idea of archival relationship in general. 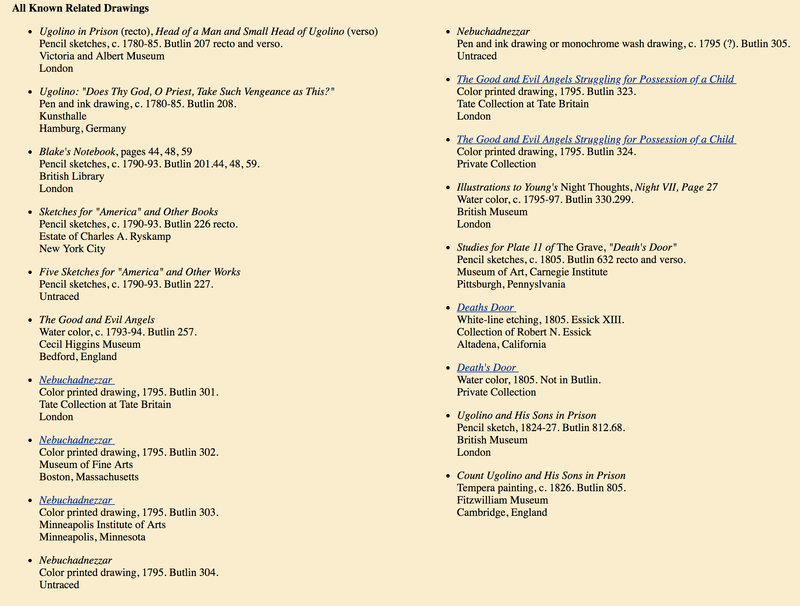 In 1993, the editors of the William Blake Archive conceived it to “provide unified access to major works of visual and literary art that are highly disparate, widely dispersed, and more and more often severely restricted as a result of their value, rarity, and extreme fragility” [Eaves et al.]. Highly disparate but not completely, since the Archive was designed to enable users to perceive relations between Blakean objects. But given the vastness of Blake’s multimedia output, these relationships, although encoded in our data, might not be readily apparent to users. 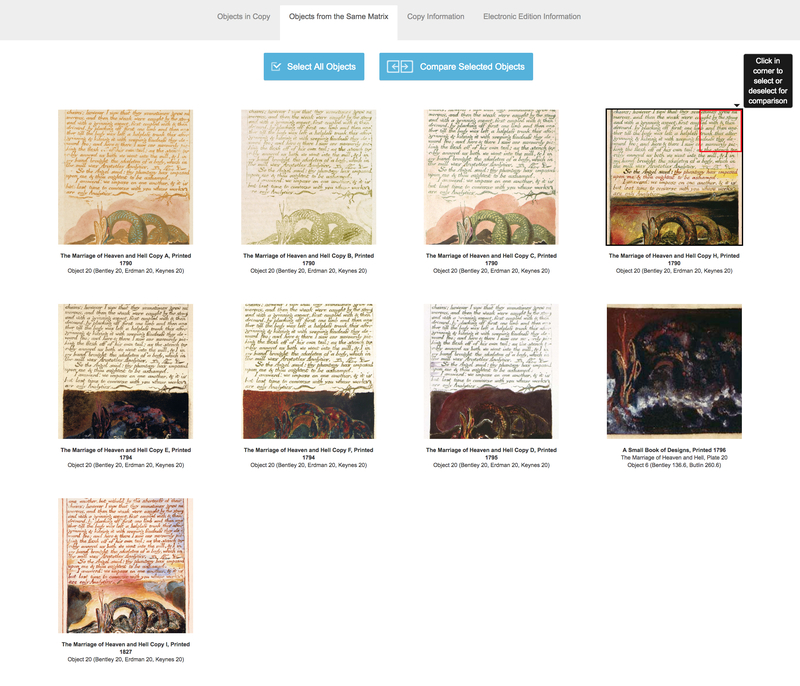 Therefore, a primary goal of the back and front-end redesign of the William Blake Archive has been to clarify and make easily navigable the numerous types of relationships that the editors have identified within Blake’s corpus. representation of relationships between digital objects and the users interacting with them. Each of these must be taken up and resolved to create a proper digital archive. Depending on the primary function of the archive, one form of the problem may raise more challenges than another. The Sentences Commentary Text Archive , to take a unique example, represents “organic relationships”, a term its editor Jeffrey Witt inherits and takes to mean relationships encoded in metadata that “can be tracked and made discoverable by future users” [Witt 2016, para. 16]. The primary function of this archive is to provide access to metadata about commentary on a literary work. Naturally, the designer must work to encode relationships falling under Portela’s categories 2 and 3. The Blake Archive, given its emphasis on quality reproductions, has, since its inception, thought long and hard about category 1, and now for its redesign, has shifted its attention to 2 and 3, particularly 2. As it will soon become clear, though, the problem of representing relationships amongst digital objects goes hand-in-hand with representing relationships between digital objects and the users interacting with them. However, the latter is not necessarily a computer-related issue; these kinds of relationships are not encoded but made implicit, and they drive a software architect’s modeling of relationships between objects as much as the nature of the objects themselves do. Insofar as relationships are concerned, the Blake Archive presents a unique case, since it is one of the only digital archives that has been in existence for decades and that is now having to reconsider its original configuration of relationships, and thus the effects that any new representation will incur. And to make matters even more uniquely complicated, as a multimedia artist and poet, Blake imposes upon digital archivists a multitude of relationships between objects that is fraught with unusual editorial challenges. 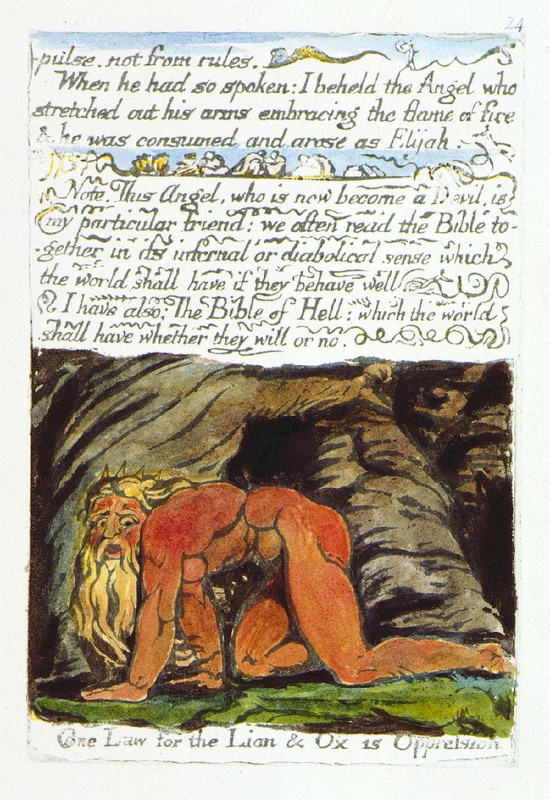 A user of the Blake Archive may discover, for example, that Blake’s bestialized image of Nebuchadnezzar crawling on all fours is found in both the Marriage of Heaven and Hell (Figure 1) and Blake’s series of large color printed drawings (Figure 2). 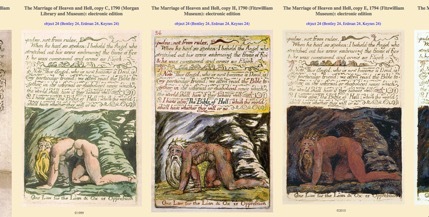 Some of these relations are currently listed at the bottom of the information page for every work of Blake’s; users visiting the info page for the Marriage — to stay on the previous example — can find the three versions of the Nebuchadnezzar color print linkable at the bottom of the page along with other drawings that the editors have identified as related to various designs among the Marriage’s twenty-seven plates. During Ashley’s tenure as project manager, efforts to address such questions hewed close to the Archive’s “original vision of Blake-as-craftsman” — thus, relatedness should be confined to the material plane. But, as we discuss below, in what we envision as a continued exploration of challenges concerning relatedness that Reed raised in her article, despite our best attempts to disambiguate relatedness as the number and type of Blakean objects published in Archive increased, the need to further reconsider the epistemological implications of relatedness became clear, especially as we are venturing into restructuring our data on a relational model. C. M. Sperberg-McQueen writes that “for computer applications in the humanities classification most often involves either the application of pre-existing classification schemes to, or the ‘post hoc’ identification of clusters among a sample of, for example, texts” [Sperberg-McQueen 2004, para. 4]. Our classification of relations is decidedly “post hoc”, and the difficulty increases given that our sample involves both texts and images. We suspect that our struggles will be recognizable to other digital projects confronting the same issues, and we hope that our redesigned site might offer one solution to handling the tricky issue of relatedness in digital archives. 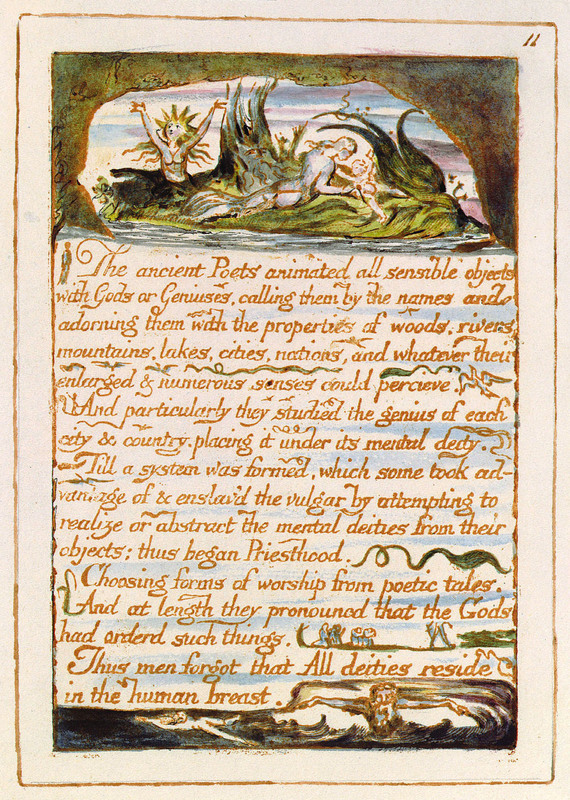 The Archive was originally designed to accommodate digital editions of various copies of Blake’s illuminated books, to which the first six years of publications attest. 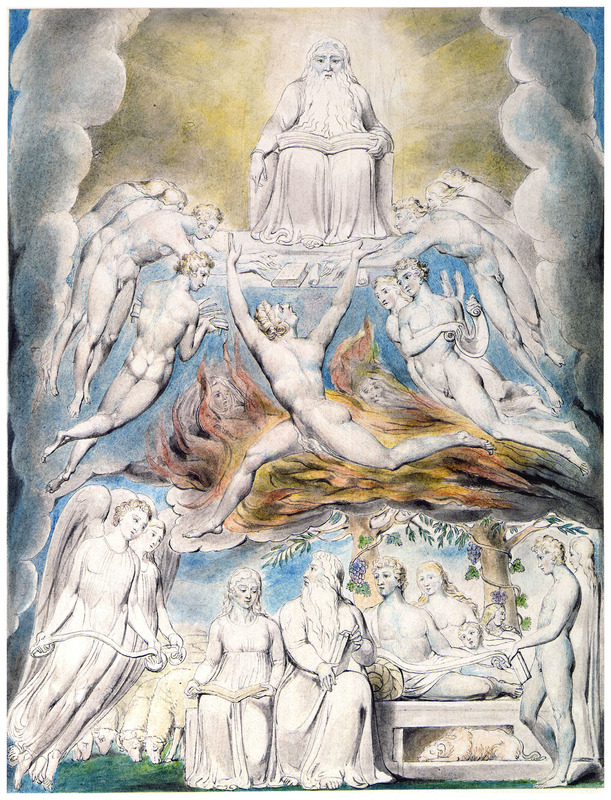 Since a work like the Marriage does not exist as an abstract, Platonic ideal, but is only physically manifested in the twelve extant copies that Blake printed between 1790 and his death in 1827 (three of which consist of only three or four of the twenty-seven total plates), the relationship between the various prints — each drawn from the same relief-etched copper plate but varying in coloring and in some instances in text and design as well — was the first and most obvious type of relationship confronted by the Archive’s early designers. As such, it is the type of relationship most deftly handled on the site. On every OVP for illuminated book plates/objects — the individual Blakean object being the fundamental unit around which the Archive is constructed — users have the option of using the “compare” feature: beneath the image of the object is a box listing other copies containing the same object, despite that object potentially being ordered in a different place in different copies; users can select which copies they wish to compare, the pertinent objects for which are then arrayed horizontally—and made linkable—in a pop-up window (Figure 4). 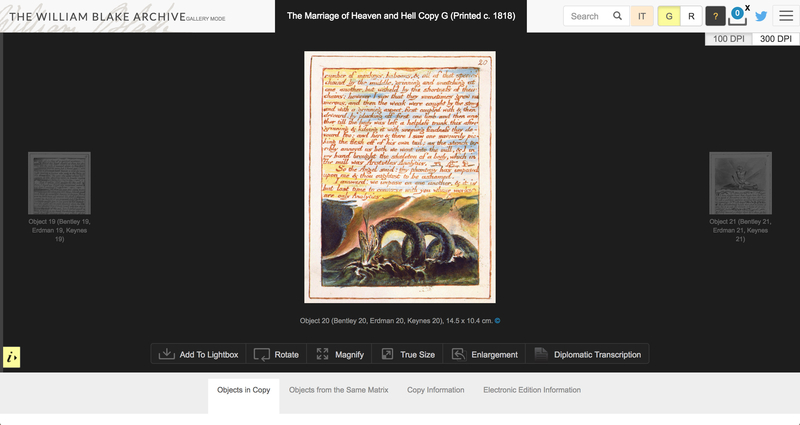 Users can easily compare and contrast objects in different copies that Blake printed from the same copper plate, or matrix. This saves one the trouble of having to shuttle between the Bodleian Library in Oxford and the Morgan Library in New York in order to determine the similarities and differences between plates of copies B and C of the Marriage , for instance. And as the Archive grew to accommodate non-illuminated book works, the compare feature still proved useful for any work that featured multiple copies, such as the two copies of Blake’s illustrations to John Gabriel Stedman’s Narrative, of a Five Years’ Expedition, against the Revolted Negroes of Surinam . But this relationship via shared matrix is only one of the many types of relationships to be found in Blake’s work. The Archive soon began to publish works that were part of what the editors called the “same production sequence”, meaning that the works are related by virtue of being prepared for a specific production. 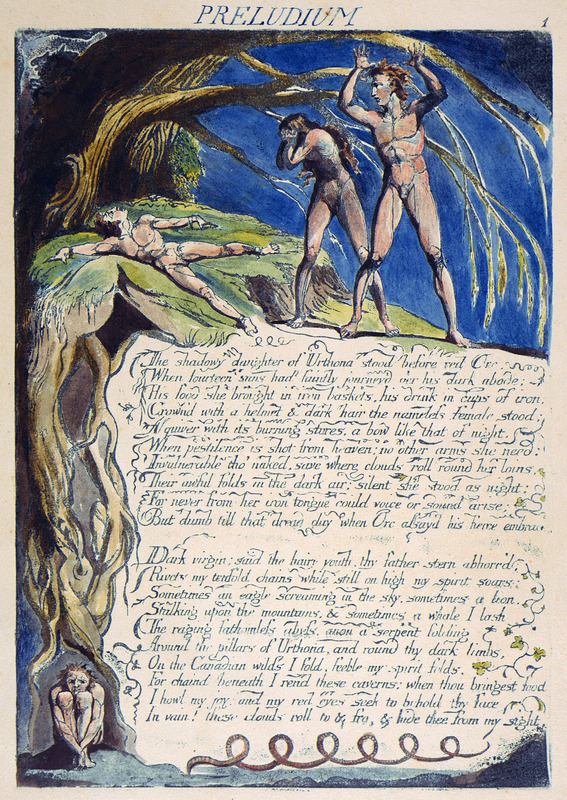 For instance a draft of the Song of Innocence , “Holy Thursday”, appears in Blake’s early manuscript, An Island in the Moon (obj. 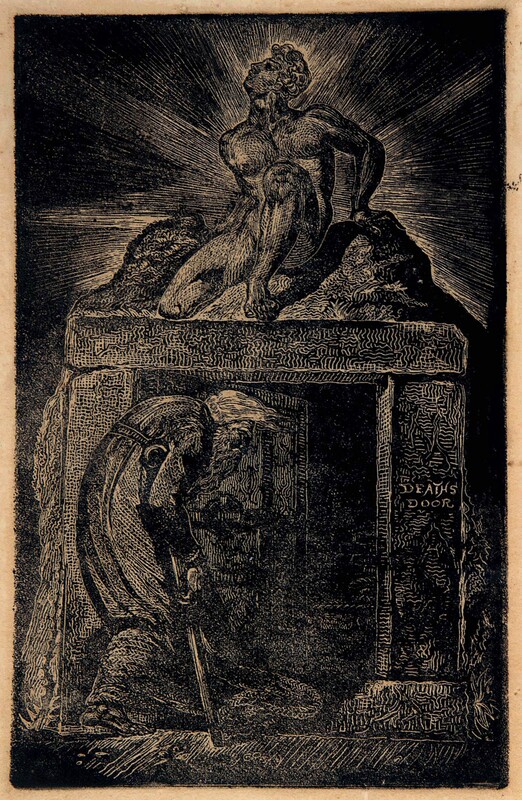 14); another well-known example is the “Death’s Door” design, which appears as both a water color and engraved illustration for Robert Blair’s The Grave , as well as the separately printed white-line etching that scandalized Blake’s patron, Robert Cromek. 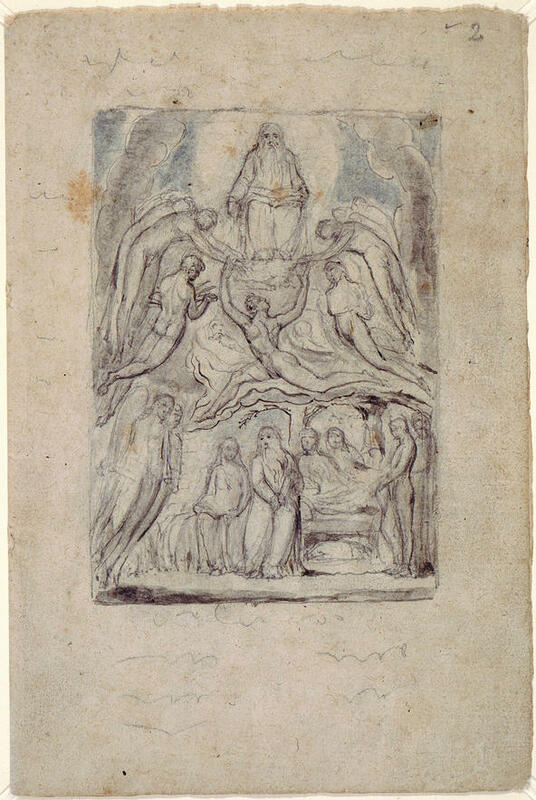 Another example of works from the same production sequence that the Archive recently published are Blake’s preliminary pencil sketches, wash drawings, and water colors for the Grave illustrations. All of these relationships, however, cannot be seen using the Archive’s compare feature; instead, users need to select “Related Works in the Archive” from the dropdown “Show Me” menu in the lower left corner of the OVP. Titles and links to the related works then appear in a pop-up window, though the images themselves are not arrayed horizontally, as they are with the compare feature. No doubt there is value for users in being able to see such related objects, but it takes a particularly knowledgeable or determined user to navigate the evasive trail between them. Other forms of relatedness began to manifest themselves as well, such as repeated text and designs in works that are neither printed from the same matrix nor part of the same production sequence, like the top half of the “Deaths Door” design that can be found on plate 8 of America a Prophecy . Such relations were not indicated on the dropdown menu of the OVP for each object, but were rather added to the “All Known Related Drawings” lists on the work information pages; but, as noted above, works in these lists are not all drawings, nor is there explanation or classification of the various types of relations being compiled. The information here was painstakingly gathered and is no doubt of value to Blake scholars, but as these lists grew and became catch-alls for various types of relationships, the need for revision became more pressing. And other questions arose: at what point does the “same” design become a “similar” design, and hence not worthy of the Archive’s deeming it relational? 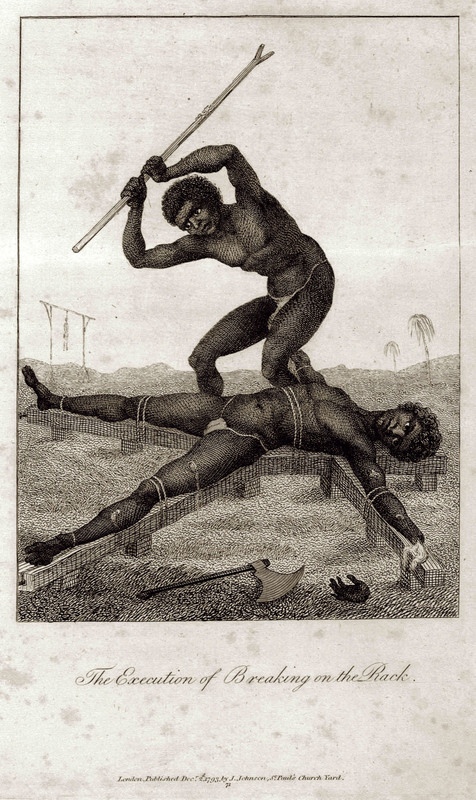 Is the bound figure in Blake’s illustration “The Execution of Breaking on the Rack” for Stedman’s Narrative (Figure 8) worthy of being conceived as the “same” design as the bound figure in America plate 3 (Figure 9)? The latter is listed on the work information of Blake’s illustrations for Stedman’s Narrative , but upon reconsideration, the editors concluded that although intriguing parallels can be made between the two similar images, they are not a relational instance of the same design, and thus the redesigned site need not include these objects as related. Additionally, should Visions of the Daughters of Albion , because it was composed shortly after the Narrative and is indebted to Stedman’s attitudes toward slavery and colonialism, be listed as a related work? And if so, why isn’t the reverse relationship indicated — why aren’t the illustrations to Stedman’s Narrative listed as being related to Visions ? Such instances seemed to suggest that the editors were venturing beyond the parameters of material relations as originally envisioned. Listing all thematic relationships was a step toward the unhelpful terminus of declaring all objects in the Archive related because they were all created by Blake. 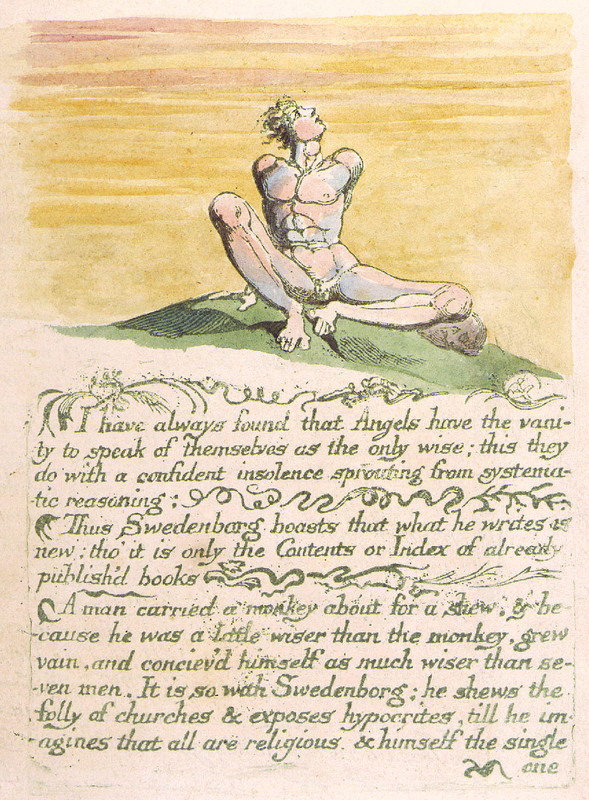 to query the Archive for all instances of angels, for example, or for all designs featuring a male figure lying bound with arms and legs spread; among the results for the latter example will be America plate 8 and object 14 of the Stedman illustrations mentioned above — similar designs, but not the same design. On the new site, a robust search platform, Solr, will allow users to discover relations on their own, rather than relying on the Archive to present every conceivable relational instance. We recognize that the Archive, despite its aspirations to objectivity, is still, unavoidably, a mediating interface between Blake and the user, but we try to minimize the effect of that mediation; we present hard-coded relationships within the Blakean universe that we deem to be material, but we do not limit a user’s power to see other relationships, namely interpretable relationships. Even if we were to implement algorithms for generating relationships, a user, with the powerful search engine we are designing, will still have the freedom to ignore those relationships and discover others for himself or herself. 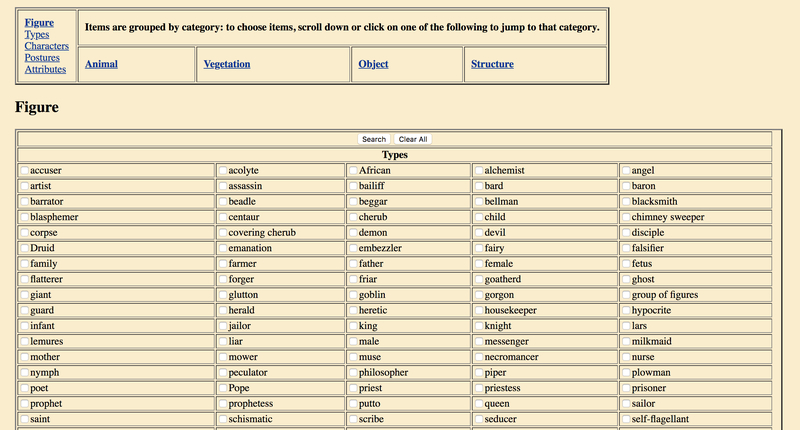 And an improved Virtual Lightbox, the basic image editor provided with the site, will, like this search engine, allow users to explore and analyze potential relationships between Blakean objects in a digital space separate from — and thus not dictated by — the Archive.As Reed articulates it, while the editorially determined categories of relatedness are, as such, inherently biased, the search and Lightbox functions allow for “user-generated connections” that are “not bound by the Archive’s own standards for relatedness, but are left to the user’s discretion” [Reed 2014, para. 16]. objects with the same design, title, or subject. The last category could certainly be subdivided, but we are using it to cover all remaining instances of relatedness that fall outside the first two categories and that could not be discovered via the search function. On the new OVPs, pertinent relationships will be indicated by tabs directly beneath the images (Figure 11), objects to which the user can scroll on the same webpage (Figure 12). All of these categories address object-object relationships that have a material or textual basis. To the extent that it’s possible, we have tried to limit the relationships we identify to exclude interpretive ambiguity. Textual relations require their own categories, and we are currently discussing how best to classify them. The search function is certainly helpful if the user already knows what text she is searching for, but we feel that indicating pertinent textual relations on the OVP — also indicated in tabs below the image — would also be beneficial. But a preliminary list of various types of Blakean textual relations, generated by the Archive staff at the University of Rochester who handle Blake’s manuscripts and typographic works, reveals how quickly such taxonomic efforts can become complicated. The list includes categories that involve early drafts of finished works (like the version of “Holy Thursday” that first appears in Island and the Moon and later becomes a song of Innocence), repeating lines in disparate works, descriptions of and references to visual works in the Descriptive Catalogue and letters, texts that fall into the same special group (like those listed in the Descriptive Catalogue ), texts that comment on, react to, or annotate other texts (such as the “Motto to the Songs of Innocence & of Experience” in the Notebook ), and more. But two larger textual categories can accommodate all of these instances: text-text relationships, and text-image relationships. Although only the relevant relational tabs will appear beneath the object image on the OVP, we could nest the particular species of textual relationships within either of these two genus tabs in order to avoid cluttering the OVP. But of course a major objective for the redesign is to no longer hide the types of relationships that we have made accessible in the database. Here we are navigating the fine line between being transparent with the types of relationships we are encoding and presenting, and not overwhelming the user with too much information on the OVP. As Morris Eaves wrote in one of the many emails addressing this topic, “What began as a pretty simple matter of reference and utility (it’s handy to know that there are preliminary drawings of the engravings that Blake produced in illustrating Wollstonecraft; that there are multiple related versions of the Job designs and some of the illustrations to Milton; etc.) can pretty easily become an almost metaphysical matter. I think we all want, and should want, to resist that” [Eaves 2015]. It is difficult to keep matters simple when editing Blake, and as it turns out, trying to do so has forced us to at least consider the metaphysical nature of relationality, since we are now shifting to a relational database, which will serve as the ontological foundation for the Archive. The BAD, an XML document, is the main data document in the Archive. Each one contains contextual information for a particular copy of a particular work, such as The Marriage of Heaven and Hell Copy G. A work information page, also an XML document, contains contextual information common to every copy of a particular ideal work, like The Marriage of Heaven and Hell . And a virtual group XML document puts together a set of works that are related in some special but concrete way of which Blake himself never conceived. For example, the set of all of his water colors illustrating the bible. The current site runs on a non-relational database called eXist, which requires XQuery, a functional programming language, to access. Our eXist instance holds all of our XML data, which includes the three types of documents relevant to this matter of relation: to repeat, they are our BADs, our work information pages, and our virtual groups. Each one handles relations differently in terms of encoding the relations and relying on functional code to complete the programmatic representations of the relations. Most relations run across the BADs. We say “across” since one BAD contains information for only one work, which may have one or more objects associated with it. This means that a representation of a relation is only half-complete in a single BAD. An XML element or attribute for one object in one BAD encodes the ID of a related object in another BAD. Non-intuitive XQuery code provides the connective tissue. Our work information pages consist of lists, among other things, of “All Known Related Works”,which, as we’ve said, contain a mix of various types of relations. No connective tissue is required for these, but they are not encoded, in the sense that they are simply given under the heading in plain English, “All Known Related Works”. Un-encoded, they are a challenge to display in more than one way and alongside encoded relations. The relations made explicit in our virtual groups require no connective tissue, either. And they are encoded but exist in a sort of virtual state; that is, they are relations only by virtue of their constituent members being next to each other in one file and isolated from other virtual groups. In the segment of a BAD below, the value of the @compwith attribute of the element <desc> is the object ID of an object related by type 1 to the object of object ID mhh.g.illbk.11. The latter object is object 11 contained in this BAD for The Marriage of Heaven and Hell Copy G. The former object, with its reciprocal @compwith attribute, is object 2 contained in another BAD for another work, A Small Book of Designs , the ID of which begins with the string “bb136”. An XQuery expression in the code makes the connection. In the following code snippet from a BAD, the <related> elements indicate object IDs of objects related by type 2 to the object of ID but146.1.wc.01, the only object of the work “Enoch Walked with God.” Again, an XQuery expression in the code makes the multiple connections to complete the representations of the relations. One can imagine reciprocal <related> elements for each of the related objects contained in their own BADs. In the following snippet from a work information page, a relation of type 3 is indicated. All of the objects, in this case one object, in the work of ID esxiii, Deaths Door , are shown to be related to The Marriage of Heaven and Hell plate 21. This work information page, beyond the snippet below, contains multiple <relationship> elements, indicating further objects relating to Deaths Door . As XML elements, they are technically encoded, but their kind is not precisely distinguished like the relation types of the previous two examples. As such they don’t lend themselves to a better exhibition than a textual listing. And the object IDs of all the related objects are not immediately apparent. To form the link to a related object that is actually in the Archive, an XQuery expression must read the <link> attributes, string them together, and find the resulting ID in the pool of BADs in the eXist database. Relief and white-line etching, 1790. Bentley 98, plate 21. The following snippet shows part of a virtual group defined by the editors as Water Color Drawings Illustrating the Bible. Works, in this case single-object works, are grouped together by their IDs using <include> elements. Virtual groups can be thought of as editor-defined ideal works with multiple objects; they are the most interpretive of the sets of relations in the Archive. Is the current method of representing relations convoluted? Absolutely. Not conducive to change? Not admissive of further types of relation? Yes, yes, hence the dire need for simplification. The process of creating this PostgreSQL table required us first to parse our XML documents with a PHP XML parser to isolate and pull out the relevant values of the elements and attributes for the first two types of relationship, objects printed from the same matrix and objects from the same production sequence. We then appropriately inserted these values into a temporary Excel spreadsheet to be verified and validated, to borrow terms from computer science. Verification in computer science is the process of checking whether the software satisfies the specification. Validation is the process of checking whether the specification of software meets the customer’s expectations. Translated to the science of digital editing, in this case, verification was the process of checking whether the relations pulled out were “correct”, and validation was the process of checking whether the set of relations pulled out for each type was “complete”. Each of the two sets was determined to be complete if it contained all of its expected relations between works in the Archive, not in Blake’s entire oeuvre since the Archive doesn’t have all of Blake’s works. We are thankful for having had diligent editorial assistants and knowledgeable editors to help. Making another spreadsheet for the third type of relation, objects with the same design, title, or subject was even more tedious because, as noted, the third type is handled by our work information pages, which don’t actually encode the relations they express. We had to painstakingly go through each listed relation, given in plain English and already verified and validated, find the object ID or IDs associated with the relation, and manually type them into the spreadsheet. It was during this process that the staff had the most conversation about what relations in the Archive should be explicitly distinguished. In the end we decided to keep these relations lumped together under the very inclusive third type: objects with the same design, title, or subject. Part of the reason for our decision was because our lists of “All Known Related Works” contain some works currently not in the Archive. Creating a third spreadsheet of relations for the fourth type was more straightforward. First, we assigned each virtual group a unique id. Then, we used a PHP script to collect the object IDs for each BAD ID in each virtual group and labeled them according to their corresponding virtual group IDs in the spreadsheet. Now we had three spreadsheets of relations, of which the first columns consisted of object IDs. We imported the spreadsheets into PostgreSQL tables and joined them on their object IDs into one table. A “join” operation combines the information from multiple tables, based on a common field between them, in this case the object id. We then merged rows with the same object IDs and made the table commutative. The commutative property in this case holds that if object X relates in some way to object Y in the table, then object Y must be shown to relate in the same way to object X. The malleable table may take on non-commutative relations in the future if we find that such relations exist between Blake’s works and decide to exhibit them in the Archive. The beauty of the table is that it is readable to editors and at the same time programmatically efficient. An editor can refer to it, augment it, and adjust it like the index of a book, and a programmer may access its represented relations with simple SQL statements rather than convoluted XQuery code unique to each type of relation. In Blake’s terms, the table is a single composition of thousands of minute particulars. Once we are done classifying textual relations we will encode them appropriately in the table. We are currently using a C++ program called Superfastmatch to programmatically discover the textual matches across all of Blake’s works and between his works and other works he is known to have referenced like Milton’s poetry and the King James Bible. Superfastmatch is the open-source bulk document comparison technology behind churnalism.com, a website built by Media Standards Trust used to distinguish original journalism from regurgitated journalism. We encourage the use of Superfastmatch in digital humanities endeavors similar to ours. As we redesign our site, we are also developing a prototype making use of Superfastmatch in conjunction with our editor-defined relations as a relation suggester: if object A relates by type X to object B and object B is shown by Superfastmatch to contain a textual match with object C, then the tool will suggest to the scholar that object A and object C might be related in some way yet to be defined, that a loose transitive property might hold for the relationships amongst these objects. ‘Might’ is the keyword here. The scholar may use his or her own discretion in deciding upon the validity of the suggested relation and the nature of it. Such a human-in-the-loop algorithm directs the discerning critic’s attention but respects his or her own sensibility and expertise. A computer is an enabling technology, not a replacement for human perception. We are also developing a prototype employing Superfastmatch together with the collation tool Juxta, which finds differences between documents, not similarities. This tool will allow a user to select two or more object transcriptions in the Archive and see their similarities and differences at the same time in a user-friendly environment constituting yet another instance of coincidence of opposites in the world of Blake. We imagine it in production to be a fine addition to our image comparison feature, enriching the Archive’s web of relations even more. 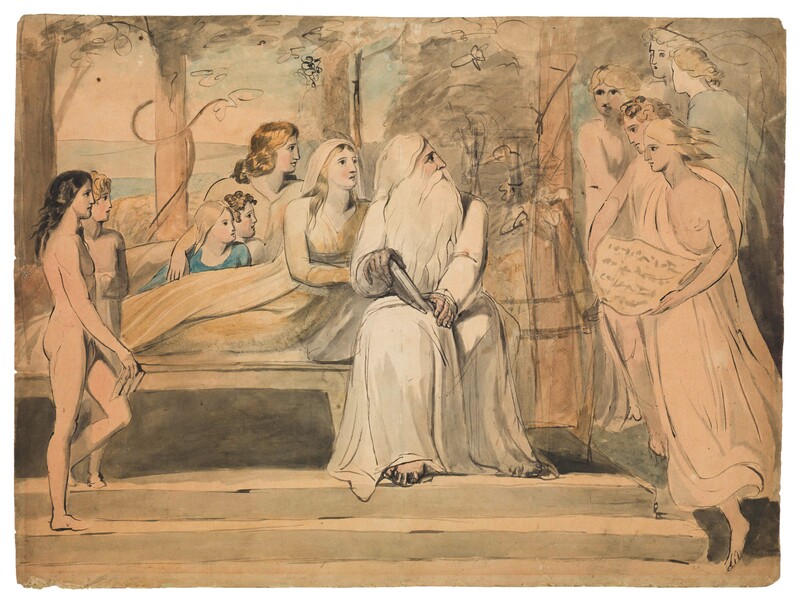 The difficult task of presenting more kinds of relationships in the Archive has compelled us to reevaluate Blake’s methods and reencode the connections between his works accordingly. As we have shown, we have had to set new specifications and engineer a new implementation for this part of the Archive, all while doing the same for the back and front ends of the rest of the site. And at the moment of this writing, the redesign is still in progress. We anticipate the need to address unforeseen questions and challenges as we further define and implement textual relationships, and as we continue to refine the interface to most clearly display the various types of relations we have identified. A clearer and more systematic handling of the complex relations among Blake’s art is just one of the many improvements that a redesigned Blake Archive will offer. But the process of achieving these improvements does not have to benefit only the Blake Archive and Blake scholars. We hope that editors of other established digital archives, especially those archives in need of upgrades and with potential for exhibiting further relationships between their items, would learn from our practices. Particularly relevant here is our commitment to move from an XML query engine to a combination of the relational database, PostgreSQL, and the robust search engine, Solr. When we debated this transition and sought advice from other digital humanists, the responses we received were far from unanimous, yet all expressed strong conviction in their particular opinion. In the end, we opted to keep our data (BADs and info pages) in XML, not to abandon XML altogether, which many whom we solicited advised. Leaving our BADs intact is reassuring to the editors who have invested decades in creating them and who are familiar with their structure. But the addition of the table of relationships between every object in the Archive offers a more efficient and intuitive way to harness this aspect of our data. And typing the table into existence, we imagine this notion of archival relationship exploding into one “amongst” archives not just “within” them, and we invite collaboration in this regard. We also intend to do a further study on the philosophical context of Blake’s practice of making related works of art, and on the philosophical context of our practice of archiving these related works. Blake emphasized through his aesthetic the independent nature of the “Singular & Particular”, which he claimed to be the foundation of the sublime (E 647). Yet, as we have shown, Blake wanted his audience to see parallels between the objects of his works. In this way, he was more in line with Locke and Locke’s followers than one might expect, given his well-known critical stance against them. Being able to relate discrete ideas, or perceptions, was for these contemporaries of Blake foundational to higher levels of abstraction. While classical metaphysics divided the world into substance, mode, and relations, prioritizing the first, Locke’s Essay Concerning Human Understanding made relations most fundamental to his epistemology. Knowledge itself he defined as “the perception of the connexion and agreement” between ideas; when two discrete ideas agree, they bear a likeness to each other; they involve a relation [Locke 1975, 4.1.2, 525]. Exactly what allowed the mind to connect related ideas remains a mystery in Locke’s theory, but nevertheless, the ability of the mind to do so played a crucial role in the associative psychologies of Hume, Hartley, and Priestley later in the eighteenth century, all of whom acknowledged their debt to Locke. The concept of relatedness in the context of archival practice may be historically situated in terms of 16th-century types of similitude, particularly “analogy”, the third of four that Foucault discusses in “The Prose of the World”. Like the first, “convenientia”, “analogy” is conceived in terms of connections or bonds, and like the second, “aemulatio,” it disregards distance in space. But it threatens to proliferate out of control, unlike the others, because it is not limited to the substantial; it admits subtle and abstract resemblances, the invisible [Foucault 2002, 24]. Analogy was reflected by negation in the idea of the cabinet of curiosities, a kind of collection, originating in the Renaissance, that contained objects whose analogical relations were not rigidly defined. Each object related to every other by virtue of being grouped together and falling under categories that bled into each other. Such a world precludes a spectrum of meaningfulness amongst relations. To prevent an archive from being a cabinet of curiosities, the archivist must delimit analogical relations between its objects. As Foucault says, “man is the fulcrum upon which all these relations turn” [Foucault 2002, 25]. The digital archivist, in particular, must also set the boundaries of the relations into a kind of spatial map conducive to computation. He must “encode” the relations because he caters not just to people but also to machine. The relations he brings into being have to be accessible to the mind as well as the code. This new type of similitude, analogy that is not “freed from the law of place”, we may call grounded analogy [Foucault 2002, 21]. It is one thing that separates nature from machine, and we’ve kept it constantly in sight while redesigning the front and back ends of the William Blake Archive. The first non-illuminated book publication was the Butts set of watercolor illustrations to the Book of Job in February, 2002. As former Blake Archive Project Manager Ashley Reed puts it, the Archive’s “most basic ontological units are the ‘work’, the ‘copy’, and the ‘object’: art-historical terms that, in the case of Blake’s work, exist on a kind of sliding scale from the theoretical to the material” [Reed 2014, para. 11]. According to the Archive’s Editorial Principles, “we emphasize the physical object — the plate, page, or canvas — over the logical textual unit — the poem or other work abstracted from its physical medium” Eaves et al. (italics theirs). The Archive uses “object” rather than “plate”, since “object” applies across all media, encompassing pages pulled from copper plates, pages containing pen and ink drawing or text, canvasses containing tempera painting, etc. Relatedness by production sequence is also treated differently in the code from relatedness by being printed from the same matrix, as explained later in this essay. The lists on the work information pages also contain works not in the Archive, gesturing toward a complete Archive, in which all relations between Blakean objects are identified. Changes to Java have necessitated that the Virtual Lightbox undergo a redesign along with the rest of the site. 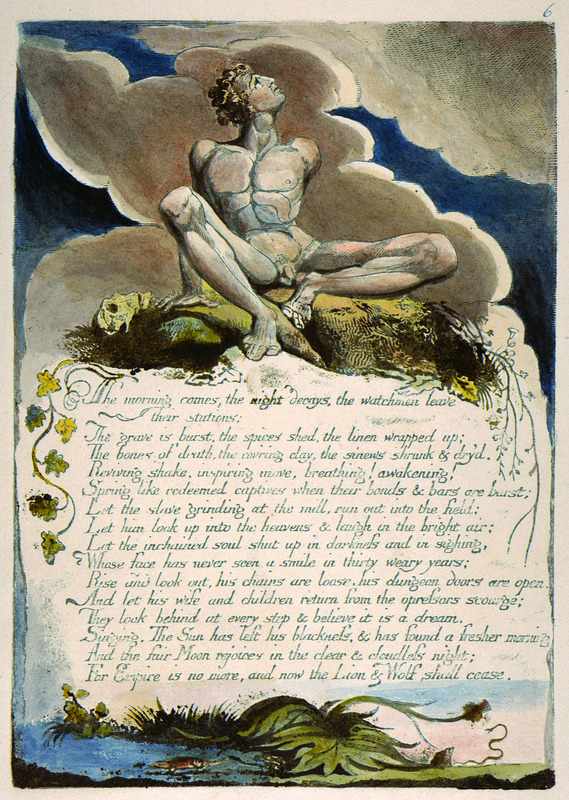 It will remain a crucial tool for users to forge their own connections within Blake’s vast oeuvre. Objects/Works with the same title could of course also be discovered via the redesigned search. This list immediately grew. An additional instance of texts related to images was subsequently identified by Robert Essick: lines of text that aren’t explicitly intended to describe a visual work (as they are in the Descriptive Catalogue ), but nevertheless describe a design executed elsewhere, for instance, as Essick writes, “the description of ‘London blind & age-bent … led by a child’ in Jerusalem pl. 84 and the design for ‘London’ in the Songs of Experience ” [Eaves et al.]. In the case of letters or other manuscripts that reference an entire work and not a particular copy of that work or object within it, we have opted to retain our current practice of listing such relations on the work information page of the letters. For the sake of clarity and efficient use of space on the page, we decided to show numbers for object IDs in the table here, but we actually use a complex naming convention for the object IDs. With this new paradigm for our relational data, the relations represented in our XML files have become obsolete. In fact, given the way we use Python scripts in the new application to import the rest of the data in our XML files into PostgreSQL tables, our XML files as a whole have become relevant only to us as editors and editorial assistants. The files are never dynamically accessed by our application, as they were in the past when we used eXist. This is a good thing because it means that all of our data, not just the relations we have been discussing, get converted into a format accessible to the public through an API, and with this API, we have made a significant step in the direction of joining the Archive to the Linked Open Data community. The API may be accessed at http://www.blakearchive.org/api with the following commands. Note the bolded GET commands for retrieving our relational data. (The data returned from the GET commands are in JSON, the universal data-interchange format). One would think that the inverse of Juxta results would constitute similarities between documents, but Juxta works on the “diff” algorithm, which relies on its input documents being somewhat similar already; that is, it cannot find differences that are too far apart from each other between documents. Juxta is a wonderful tool for different versions of a text but not for disparate texts that have sparse references to each other. Aristotle, for instance, conceived of relation as a third entity subsisting between two discrete objects/substances, without which entity it would be impossible to determine that the two objects were at all related ( Metaphysics , 1088a25-30). Aristotle 1941 Aristotle. The Basic Works of Aristotle , ed. Richard McKeon (New York: Random House, 1941, rpt. New York: Modern Library, 2001). Eaves 2015 Eaves, Morris. “Re: Relatedness: texts”. Message to blake-proj@listserv.unc.edu. May 14, 2015. Foucault 2002 Foucault, Michel. “The Prose of the World”, in The Order of Things: An Archaeology of the Human Sciences (New York: Routledge, 2002). Locke 1975 Locke, John. An Essay Concerning Human Understanding , ed. Peter H. Nidditch (New York: Oxford University Press, 1975).